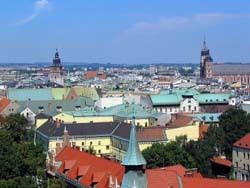 The presented room availability, rates and discounts are actual and final for all our 553 hotels in Krakow. Barbican Castle is one of the famous historical attractions of this place. The castle is one of three most beautiful fortifications in Europe. Despite the fact the caste has survived in many battles, it is preserved perfectly and the building never ceases to amaze visitors with its power and majesty. Florian's Gate is another outstanding historical monument. It was built in 1307. Initially, the gate was a part of a large-scale defense complex. Besides the gates only a portion of the adjacent tower has survived till our days. There are many notable religious buildings in Krakow. Church of the Holy Cross, built in the 14th century, is surely among them. The halls of this beautiful Gothic building are decorated with hand-painted pictures, made by the legendary monk Stanisław Samostrzelnik. Don’t forget to visit Zygmunt Chapel, near which you will find the graves of great Polish kings. The legendary Wawel Hill remains one of the main symbols of Krakow. According to an ancient legend, once a dragon lived on this hill, but it was defeated by Prince Krak. An ancient cave has survived on the hill. In the past this cave has been the dragon's lair. You will also find a beautiful palace complex and an old church nearby.